Symbol maps are maps on which data about specific locations (e.g. cities) is represented with geometric shapes (e.g. circles). These kinds of maps shouldn't be used if you want to show data about areas, like the population of all countries or the criminality rate in all Chicago neighborhoods. Choropleth maps are the better choice for that, and we show you how to build them here. But symbol maps are great if you want to show the data for specific geometric locations, e.g. to show all McDonald's restaurants in the US, all UFO sightings worldwide or the location of National Parks. Before we can visualize the unemployment rates, we need to bring it in the right format. Datawrapper will need addresses or longitudes/latitudes to know where you want your points to be. For our map of US cities, the city names will serve as addresses. Datawrapper will map them automatically (that's called "geocoding"). As you can see, we added a fourth column: "population 2016 for tooltip". We will use that information for the tooltip, so that we don't need to take the long number chains from the "population 2016" column. Why should you upload longitudes and latitudes when Datawrapper can just transform our city names into points on the map? Because the names of cities (or any other places) might exist more than once or might be written differently in different languages. For example, there are multiple Vancouver's around the globe. If you give a geocoder (like Google Maps or Datawrapper) "Vancouver" as an address, it will assume that you mean the biggest Vancouver, in Canada. But the "Vancouver" in our table actually refers to the Vancouver in Washington state. When using city names as addresses, Datawrapper will map Vancouver in Canada. When using longitudes and latitudes, our Vancouver appears (correctly) in Washington. With longitudes and latitudes, you can be sure that Datawrapper maps every point exactly where it's supposed to be. Click on "Import Data", then choose if you want to import addresses or latitudes/longitudes, then copy & paste your data into the table that appears. That is the most convenient option and you'll probably use it most often. Click "GO! 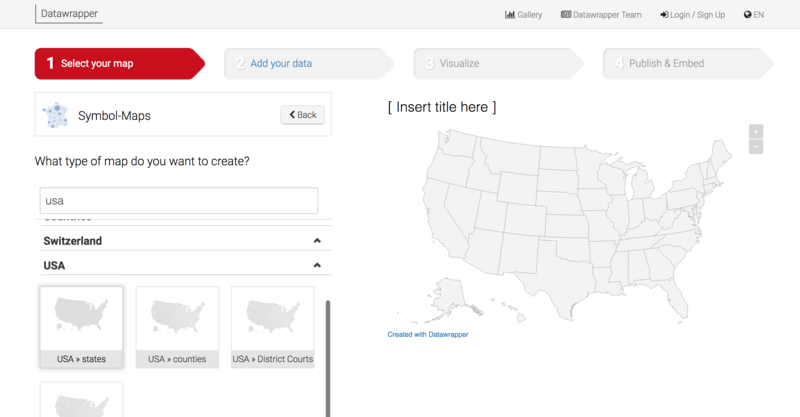 ", check the data in the table again and then click "Proceed" to get to the next screen, where you can customize your map. We will cover this part in the next tutorial: Customizing your symbol map. We are aware that for some countries and languages we do not have the correct local names, in Datawrapper we so far usually use the English geographic names. We are working on a solution to change this and enable users to display names as they are written in their local language.